Hello! Today I’m sharing my ultimate guide to freezing lemons, oranges and limes, as part of Zero Waste Week. For Zero Waste Week I’m aiming to further reduce the amount of food I waste. I’ve already made strides with this, but undoubtedly there is still more that I could do. 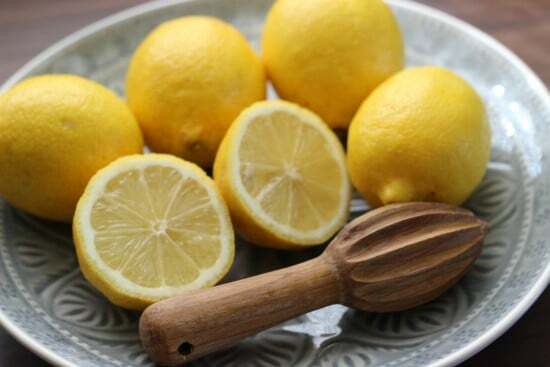 Citrus fruit can be hard to compost so it’s a good idea to use up as much of it up as possible: with this guide you can use pretty much all of the lemon up with very little waste. You can freeze the zest and juice of citrus fruits, and, the best part, freeze individual slices of citrus fruit. Isn’t that pretty revolutionary?! As a keen gin drinker the idea of always having a slice of lime to hand is pretty good! There’s so many times when I’ve gone to have a cheeky glass of gin and tonic of an evening and not had a slice of lime! It’s not just that though. 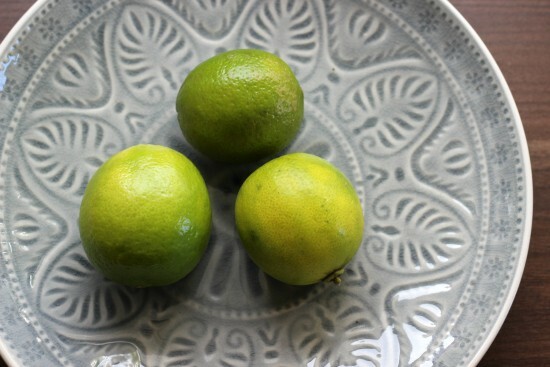 Quite often when I’m cooking or baking the recipe calls for the zest of a lemon or the juice of half a lime. In that case then the rest of the lemon or lime sits going off in the fridge. Now this wastage is no more – any leftover parts go straight in the freezer for another day’s cooking. The only part of a lemon I’m now disposing of is the pith – this composts much more effectively than when I was composting lemon peel. So, in honour of Zero Waste Week I’ve created the ultimate guide to freezing lemons, oranges and limes. Enjoy! I’ve found freezing lemon zest to be really good when a recipe calls for the juice of a lemon but not the zest. To freeze the zest all I do is grate the lemon skin with a small grater, and then pop the zest into an ice-cube tray. I then add a few drops of lemon juice to the zest. Freezing lemons in this manner means it’s really easy to pop out one portion of zest when I need it, and the juice keeps the zest nice and hydrated. 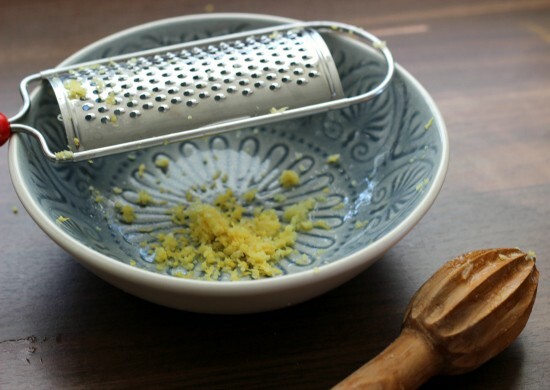 I’ve tried a few methods of freezing lemon zest – some people say to just add the zest to a small tub in the freezer, but you then have to chisel off some zest when you need to use it. Portioning the zest before you freeze it helps avoid this need for chiseling! My preferred method for freezing lemon juice is again, the ice-cube tray method. 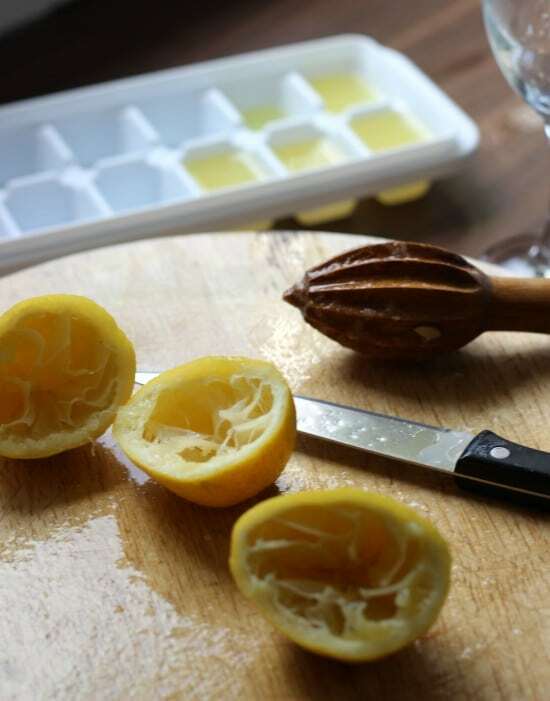 If your recipe calls for the juice of half a lemon, say, then simply squeeze the juice out the other half and pour it into ice-cube tray compartments. One ice-cube is equal to about two teaspoons of lemon juice. Two ice-cubes are roughly half a lemon. Now I don’t have to buy those little plastic lemons/limes full of juice and I’m not wasting any lemons! Win! Don’t forget to zest your lemon skins too! Got half a lemon or lime left over from cooking? 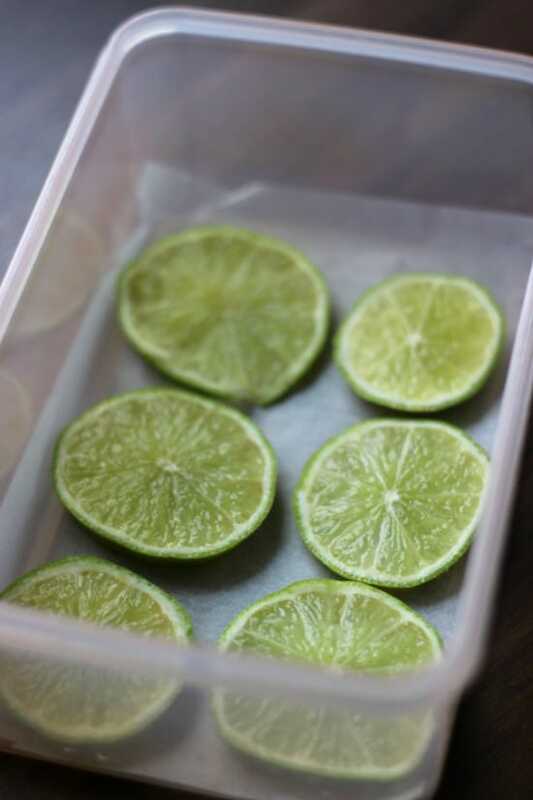 Another way to freeze lemons or limes is to cut them into thin slices, place in a Tupperware container, and then pop in the freezer. You can add additional layers of slices – just make sure you add a layer of grease proof paper between each layer of citrus slices. It’s a handy way to freeze citrus fruits as it means I’ve always got a slice for drinks, such as tea, or hot water and lemon, or for my boozy elderflower cordial! You can freeze whole lemons, but I personally prefer not to. When you defrost the lemon it goes all squidgy. It’s perfectly fine for squeezing juice from but you lose the ability to zest it or cut it into slices. I’d rather zest the lemon first and then save the juice, or slice before freezing, but it’s your call! 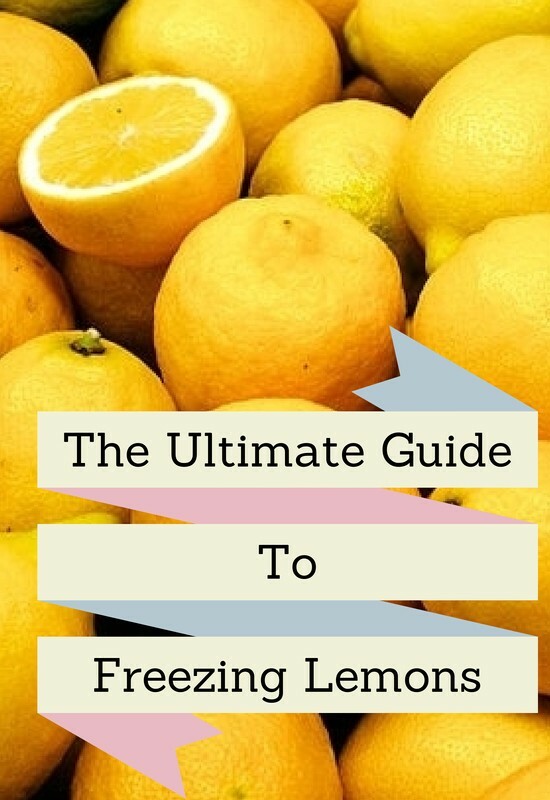 And that’s my ultimate guide to freezing lemons (and other citrus fruits!). 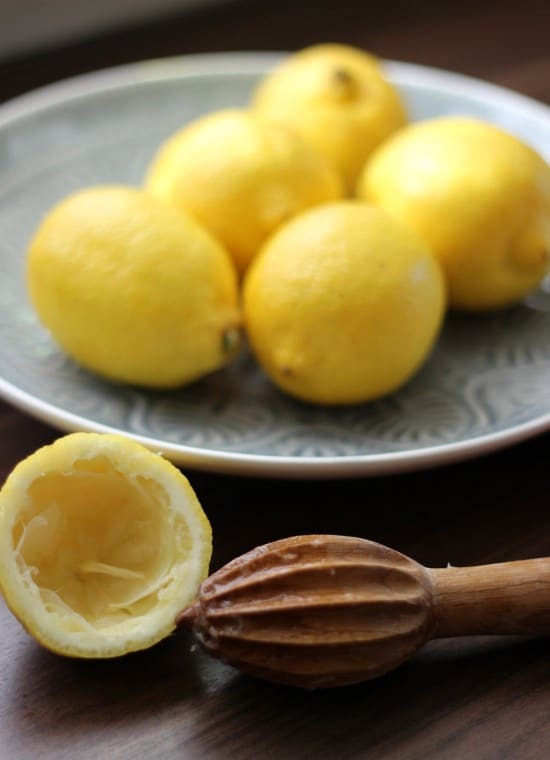 Never let another lemon go to waste again! Check out the rest of my food waste tips for more handy advice! Last year I shared a really easy way to use up black bananas with these delicious three ingredient cookies. 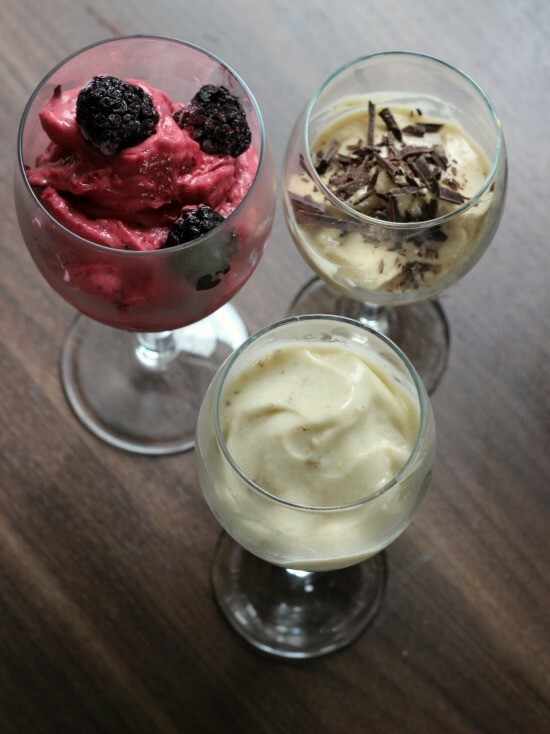 I’ve been keen to find more easy ways to use up black bananas and earlier this year came across easy one ingredient vegan banana ice cream on the Kitchn blog. I had to give it a go – not only is it vegan, gluten free and a healthy ice cream alternative – but it sounded to good to be true that you could make delicious ice cream from just a banana! 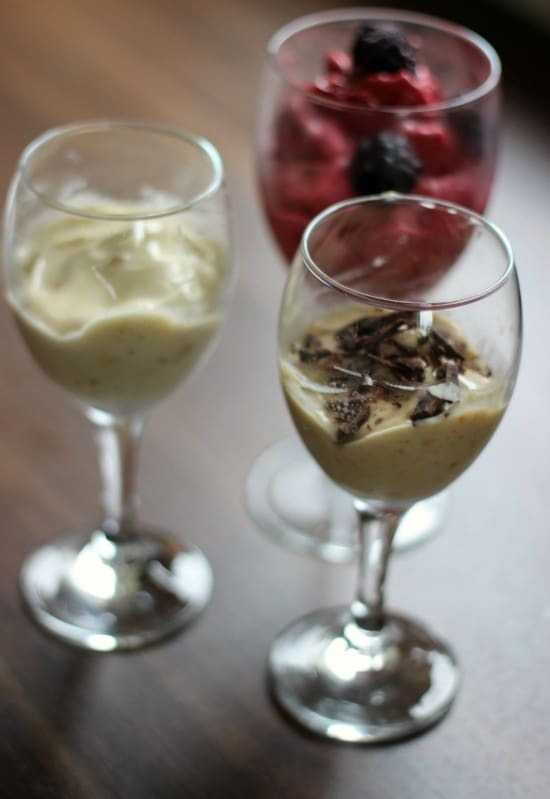 To make your one ingredient vegan banana ice cream simply place a frozen banana in a blender or food processor, and give it a whizz for a minute or two until smooth and creamy. That’s all there is to it! I had some bananas that I’d saved from going rotten in the freezer, so I fished out my food processor. My partner was very very skeptical about blending up frozen bananas to get ice cream, thinking we’d just get a soggy mess. But after just two minutes of blending, the bananas were done, and it didn’t look like the soggy mess he’d anticipated. Armed with spoons, we tucked in and I’ll admit we were pleasantly surprised that the texture of it is just like ice cream. No joke! Now, no whatever anyone says on the internet, the taste is not exactly like ice-cream. 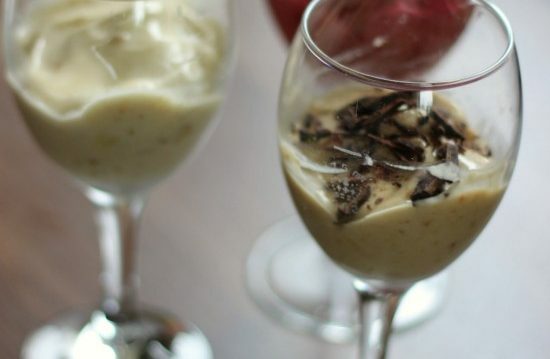 Instead it tastes like a healthy vegan banana ice cream, without anything bad for you in it. Which is no bad thing if you’re looking for a healthy treat. But as for trying to convince yourself that it tastes just like full-fat sugar laden ice cream? I’m afraid that’s not going to happen. Even my toddler could tell the difference! But accepting it for what it is as a healthy dessert? It’s delicious! After extensive taste testing I’ve naturally got some tips for making one ingredient vegan banana ice cream! Black bananas work best because a lot of the starch has been converted to natural fruit sugars. If you've got any going off in your fruit bowl simply peel them and pop them whole in a tub in the freezer until you're in the mood for ice cream. Remove your banana from the freezer about 15-20 minutes before you start making the ice-cream unless you have a really powerful food processor. It takes up to two minutes to fully blend your banana. 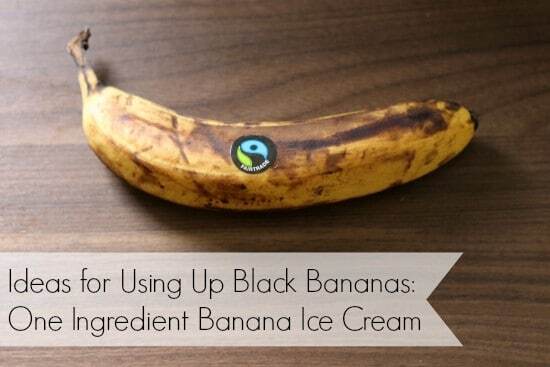 As you've already partially defrosted your banana I wouldn't recommend refreezing your ice-cream. I’ve also been trying out some vegan banana ice cream variations. My favourite one is berry banana ice cream – just remove a large handful of frozen berries from the freezer and leave them again for 15-20 minutes prior to blending. 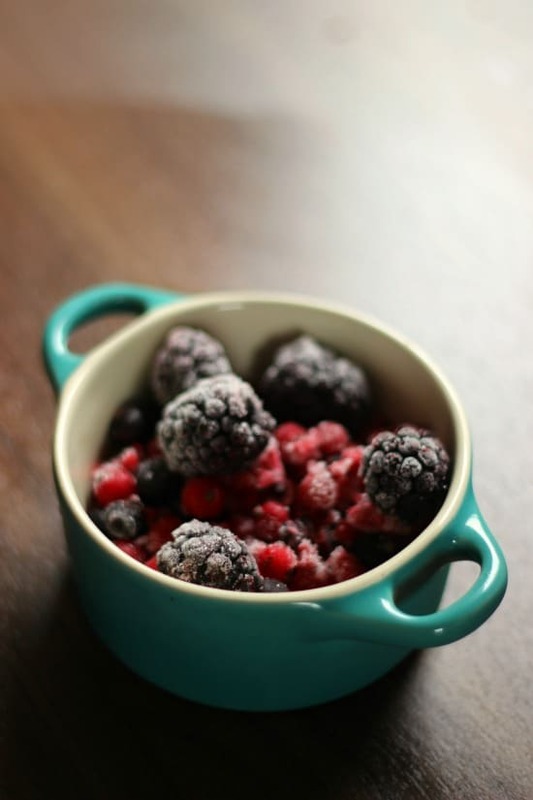 Blend your banana and berries together until you’ve got a smooth consistency again. Another favourite is the less healthy but still vegan peanut butter, dark chocolate and banana ice cream. Simply add a teaspoon (or more if you like it extra nutty) of peanut butter to the blender along with your banana, and off you go! 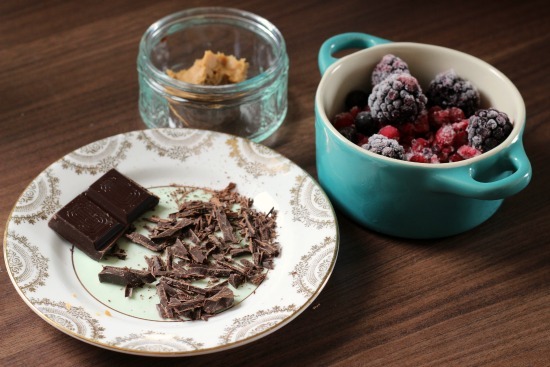 Slice up a square of dark chocolate into small slithers and sprinkle over the top for a decadent treat! I am sure there are heaps of other vegan (or non-vegan) variations on this, so do share in the comments below what you come up with! ps: the ice creams were completely impossible to photograph! They start to melt so quickly after blending, and my daughter woke up from her nap earlier than expected and was demanding ice-cream whilst trying to get these shots! Though you might appreciate these behind the scenes look into food blogging!